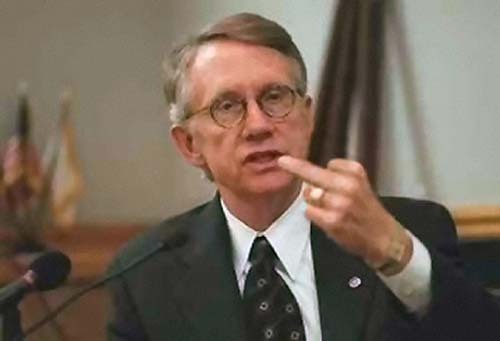 Senate Majority Leader Harry Reid is prepared to run a sharply negative campaign if thats what it takes to win reelection next year, with a top adviser predicting that the Nevada Democrat will vaporize his Republican challengers with attack ads. Trailing in the polls and under constant attack from the GOP, Reids campaign has just launched a warm-and-fuzzy million-dollar ad campaign to reintroduce the veteran senator to his constituents. But Reids team also wants to be the one that introduces lesser-known opponents to the electorate  and will be ready, when the time comes, to unleash a torrent of ads branding challengers as untested and unprepared for the job. Now in the campaigns sites: Sue Lowden, a wealthy gaming executive, former state senator and former chairwoman of the Nevada Republican Party, and Danny Tarkanian, a Las Vegas businessman and the son of legendary basketball coach Jerry Tarkanian. I expect him to vaporize Lowden or Tarkanian or whoever is the opponent, said a Reid adviser, speaking on the condition of anonymity in order to discuss campaign strategy. If the GOP can't beat this incompetent POS, they might as well hang up the cleats and go home. Lose they will, if the GOP again listens to media warnings against “going negative” while the democrats pull out all the stops. I’d like to see the woman run. Not that it would be a cakewalk for either, but women are going to tend to have fewer skeletons in their closets, so to speak, and having some nasty personal scandal just waiting for Reid’s henchmen to discover is probably the best way to ensure he gets an easy win. Don’t bet on the “legal” part. Reid only knows how to do three things, LIE, CHEAT AND STEAL! >> Lose they will, if the GOP again listens to media warnings against going negative while the democrats pull out all the stops. The GOP needs to run a “scorched earth” campaign in ‘10. Utterly destroy as many ‘Rats as possible with the fire and brimstone of truth. Lord knows they have enough ammunition. But it’s likely they don’t have brains or balls enough to use it. How about a conservative, for a change, regardless of gender or ethnicity. We’ve got a Senate full of RINOs already. Need some more backbone to help bolster the DeMint, Sessions and Inhofe wing, that is constantly swimming upstream. Vaporize? What’s Reid going to do - fart at his opponent? Ewww are they shakingin their boots???? That’s what that headline is intended to do! The economy in Nevada is going to be very poor next Fall and that will help the GOP a lot, but we still need to get after Dinghy Harry and tie him to Pelosi and BHO as much as possible. I think he definitely can be beaten in a tough, close election. lol...dinghy Harry’s going to lose in the same way Daschle lost in South Dakota. Creigh Deeds has been trying out this strategy in Virginia. His poll numbers have gone from bad to worse. So I know someone very very well. He was, for years, the personal bodyguard of a famous casino owner. He says on behalf of his boss, he used to bring Reid envelopes of cash every now and then. Reid’s been running TV here in Las Vegas for months now....as well as radio....he’s got $$$$$........have yet to see or hear anything from Lowden or Tarkanian.